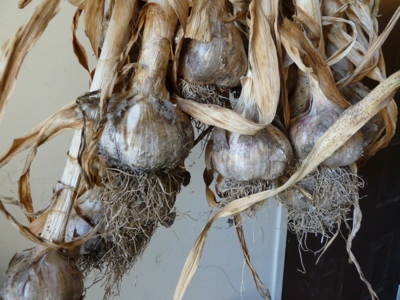 My Home and Garden: Oh yayyyy, garlic harvest day. I love garlic harvest day. I couldn't wait to dig up a couple last night in the fading day. I could see enough to tell they were bigger than last year. There were a few that were very light and had a brownish look to them. A dry rot of some sort? I have googled it and couldn't quite figure it out. Can anyone help with this? I got the garlic out and set the Music in one place and the Red Russian in another. I like them to sit and dry a bit before I bundle them up and move them to the shed to cure. 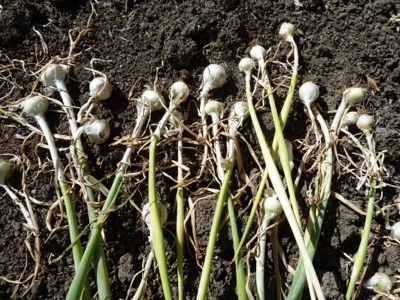 I was a bit surprised that Allan, aka The Gardener's Assistant, wanted to dig up the onions. I wasn't sure they were ready yet, but I want Allan to enjoy the gardens as much as I do, so I let him dig away. The onions look delicious! He did a great job. Not one slice on an onion. I love garlic! :) I can't help you with the question - I'm not familiar enough with garlic, sorry. I love garlic too!!! It is one of my favourite flavors.